This is the first briefing from artist William Steinman for Artist For Artist covering an exhibition The 8th Day now on view until February 1, 2011 at 5&6 Gallery in Scottsdale, Arizona; a show he embarked upon on his drive from New York City to his new home in California. After concluding my final semester in graduate school I decided to get the hell out of New York City and head for sun-drenched Los Angeles. Overflowing with so many uncertainties, confusions, anxieties, and new ideas I thought it best to spend my first month as a master of fine arts by stepping away from a studio and just looking at and writing about art. I have been forced to have a New York sensibility and my filter was set high (but that’s why I went to school in New York in the first place) but I wanted to get away and clear my mind and see what other cities where up too. Then in Scottsdale, Arizona, on my drive across the country, I saw a really great three person collaborative show. Maybe because it was in my hometown or because I felt it was close to the films I was currently making, or maybe because the next day was the last day of my week-long journey or maybe it was the desert heat. Or it could be that three unknowns made a showing of artifacts and documentations that was so obviously the best show I had seen in quite a long time. Driving into Scottsdale, Arizona (I grew up in Mesa, but it’s all one concrete sea of identical-looking homes coupled by freeways anyway) I felt a little melancholy. Not from nostalgia or homesickness, but because I had just spent the last five years looking at New York City galleries and museums. And I spent the four years before that wishing I were in New York City looking at galleries and museums. Scottsdale just isn’t a name you read in Artforum or the New York Times. It was weird to have left all this for something better, then to come back and find what you had set out to learn was right where you began. I had been down to the gallery section of Scottsdale many years earlier when I was in high school. (Concrete freeways). It seemed relatively the same, maybe a little better with the additions of a few new street art galleries and the new museum of contemporary art, SMOCA. The gallery district is mainly one story buildings, large glass front windows, lots of antiques and things I would love to fill my new apartment with, but not much to get my loin churning they way Mika Rottenburg’s films get me going. When I arrived at the gallery, I parked the car and while waiting for the director to show up and let us in, I approached the large front window, peered in and immediately felt jealous. I know that’s a bad habit, but I get jealous when I see something that amazes me because I feel it does more than my art does. I stepped away, my first move always when this happens; a defensive measure to get back to reality and remember the first look at art is always the greatest. As I stepped back in front of the window, I was still amazed. Life size weapons everywhere. Clusters of various sized black and white framed images. A mannequin in an enormous over-stuffed costume, quickly bringing Nick Cave’s Soundsuits to mind. Rooms of this stuff. I had to take a smoke break. 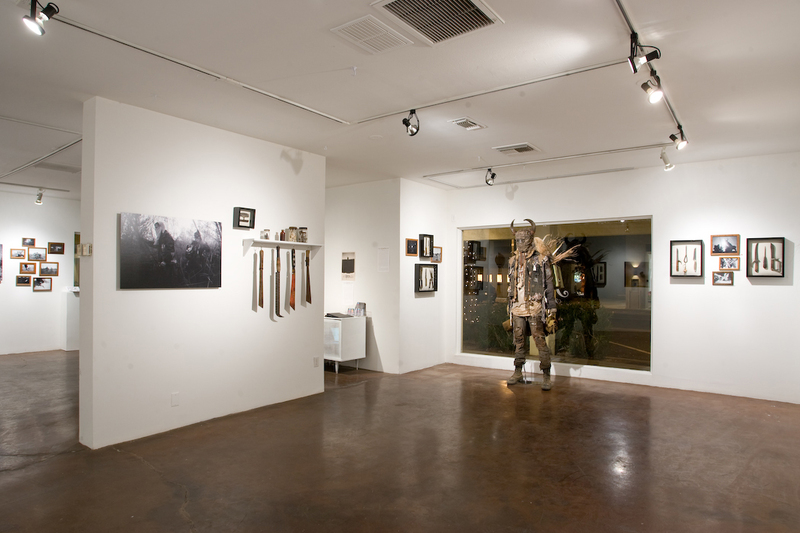 Exhibition photo of "The 8th Day" at 5 & 6 Gallery, Scottsdale, Arizona. 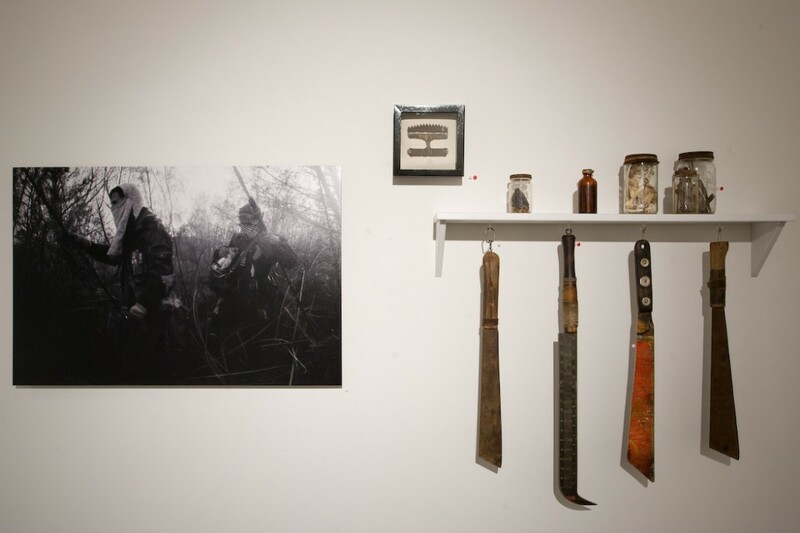 Still waiting for the “director”, I chat with the one of the three artists, Jarrett Scherff, the others being Colby Vincent Edwards and William Franevsky, who put this show together. I really tried hard to pry deep to find who exactly did what since the show seemed like such a congruent piece, instead of divided into three distinct styles. After a half hour of questions he wouldn’t budge, he really had me convinced that they all did everything equally, from costume modeling, weapon sculpting, resource finding, beeswax dipping, Adderall popping and whatever else was needed for this major undertaking. The “director” finally shows up, moving slow, wearing sunglasses and smelling like a bar. We get in and I am instantaneously taken back at the amount of effort. Essentially two full rooms of solid wall-to-wall artwork. And not in the way artists love to fill the white cube with too much material because they want to show it all off, but more like these three artists needed this entire space to tell this whole narrative. The narrative consists of two distinct elements. The life size looking pieces: the tools and weapons, the fully dressed mannequin and little glass jars full of survival kits, basically all things that have functions. And then there is black and white 35mm photos, framed 5×8 prints or large-scale images dry mounted on masonite. Much like a Natural History Museum, the artifacts are hung next to correlating images to place them into an imaginable reference. The overall aesthetic feel is an obvious reference to Mad Max and other dystopian wasteland films in pop culture. Unlike those films and the props in those movies, these three artists paid an utmost attention to detail that I have not seen in an art show in a long time. They developed a procedure of distressing and aging that I am sworn to secrecy not to write in this essay. (The aging process alone would make a good show.) They then composed the pieces collectively to the point where each object has a function but the objects are so ornamented, so striking, that you might imagine quickly what each tool or weapon was made for, but then you are instantly and absolutely lost in the tiny aesthetic details of each piece. I don’t think the photos really belonged in this show. It’s not that the black and white, 35mm super grainy images are uninteresting to look at, or underdeveloped in concept or form, in fact they are really pleasant, some of them even exceptional. 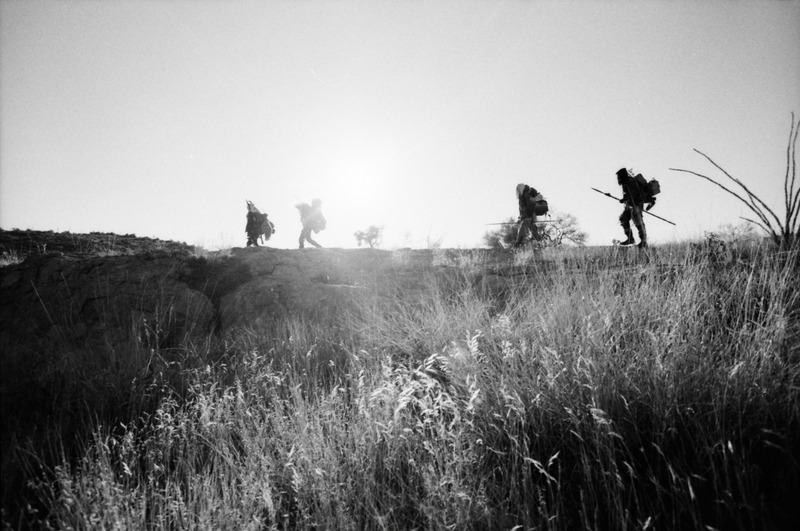 The photos depict people wearing and hauling the props from the show, modeling them in the Arizona desert. Clouds of dust streak past faces, in the background people forage in front of rugged mountains, and study weird vegetation while hiding from the intense sun. But they bring me back to reality. And I don’t want to be back, I want to be stuck in this dystopian world imagining myself carrying around a weapon and forced to use pieces from the show for survival. I want to stay totally immersed in the props. I feel like the photos might have been a singular show all together. The images worked great for the zine that they also printed. A lovely little limited edition zine printed on newsprint and jam-packed with photos and packed in a plastic sleeve. It seemed so ironic to me, to see such a good show in the place where I thought art was underappreciated. I moved away from Arizona to study and see art in New York, where it is traditionally supposed to be. But while I was away getting my fine art degree, these three artists were going against a conservative art scene, pushing boundaries and pushing themselves, because god only knows there is very little art being made to this caliber in Scottsdale, AZ.